Almost five years ago, somewhere on the internet, I came across the photo below. It burned itself into my mind and I have never been able to let it go. Years have passed and although I have worked faithfully on a vegetable garden for our family to enjoy, the play area sadly lapsed into oblivion relying on molded plastic toys to climb on or play in. 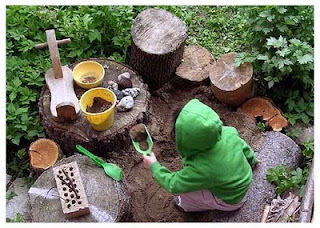 Not that I have a problem with those toys, but our tiny backyard does not have space to accommodate both and I really wanted to have a more natural play area for our kids. So now this year, I am attempting a more natural play area and garden for our kids with the hopes of keeping the girls out of the veg garden and into a safe area for them to dig, scoop and dump dirt, sticks and rocks and whatever else sparks their imagination I have tried to select flowers that provide many blooms so they can pick some and still have more to enjoy later. Of course, that means that the whole plant has to somehow stay in the ground. We have had a few close calls already, but so far everything is still growing. The stumps are for sitting or walking on which Laura enjoys while she sings or talks to herself. The dirt is soft black earth I bought in a bag. And the large tree limb is for sitting while digging or making "cupcakes". Nervous laugh. Speaking of laughter, feel free to engage in some as you view this next photo. This is my amateur attempt to build our own tipi-trellis thing for plants to grow up and provide a sheltered play area. Amazingly it has withstood both girls pulling or leaning on the "legs" from time to time with nary a disaster to date. I have planted at the base, black-eyed susan vine, one of my favorites, as well as some peas and morning glories. The latter two are under insect attack and are not doing well at all. The vine is climbing nicely. Here is another look at it along with the row of zinnias and snapdragons which will hopefully distract a little, from the ugly condo fence behind it. Yes, I used yarn because that's what I had at the time. A few areas I did not get super tight and the plants have caused it sag a bit, but I don't think it's a real problem. And this last area is under the cedar tree which up until last year as been my compost heap. But after getting badly stung on Labor Day weekend last year by an underground wasp nest as I was turning it with my garden fork, Shane thought is best not to do that again. I very much miss having a compost area but it would need to be child-proof and I think that is asking too much of our little yard to provide right now. So I took that lovely compost dirt and spread it around and planted some marigolds and a leftover pumpkin plant. Some sunflower plants are pushing up through which I'm sure is leftover from our winter birdfeeder which hangs in this tree. If they survive Laura's vigorous garden work, it will be an act of Providence. So far we've had one casualty to which immediately after occurring she said repentingly "Forry, Mama". How could you stay annoyed with that lisping into your ears and heart? And for my own sake, I post this budding snapdragon which is towering over the play garden as it finally appears ready to give some color. Did you know that if you gently squeeze a snapdragon flower on the sides, it makes the flower look like it is opening and closing its dragon jaws? Hopefully there will be a few flowers left unmangled to show Laura this neat trick. More nervous laughter. I love the trellis teepee! I want to try that some year! And I'm very jealous of you stumps! haha! I'd like to see some action shots of the kiddos playing in there sometime! I'm going to make a twig trellis too! Mine will be for clematis. I am not at all confident it will hold together, but I have a forest full of branches to try it out on. gorgeous! Can't wait to do something like this in my own backyard!